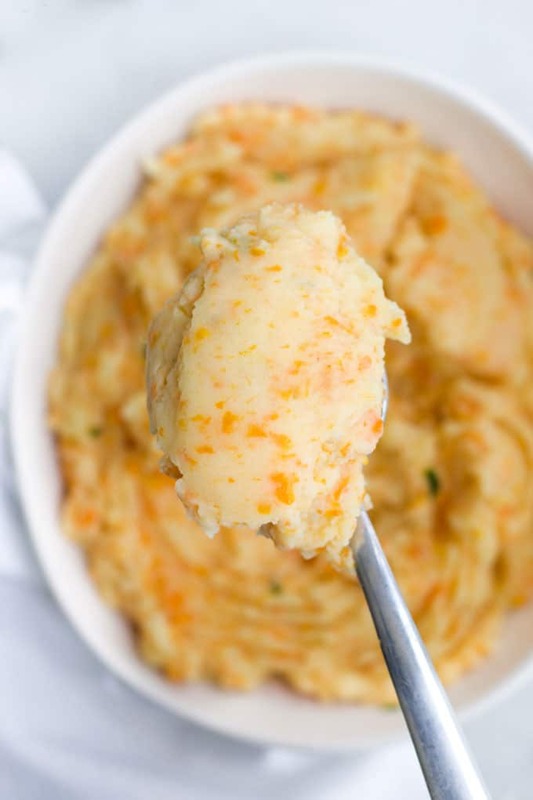 Potato and Carrot Mash is a delicious replacement for regular mashed potatoes and a fantastic way to up vegetable intake. Great as a side dish or used to top pies. It also makes a great baby puree. Reaching our daily vegetable intake goal can be hard for both children and adults. Although I do believe in exposing children to a range of vegetables, in their natural form, I am also a firm believer of adding “hidden” vegetables into as many meals as I can. I add them to pasta sauces, bolognese, pancakes, smoothies and so much more. My kids help me to prepare a lot of our meals so when I say “hidden” I actually mean vegetables that are mashed, pureed or blended into a meal. They know they are there but they could easily not know too. I recently received a message from a reader saying that she thought the pie was delicious and the potato and carrot mash was a genius idea. Her 3 yr old, who really isn’t keen on his veggies but loves potatoes ate the mash with no issues. She now mashes a range of vegetables into her mashed potato. Broccoli, cauliflower and avocado have all been mashed with potato with great success. Messages like this really make my day and are the reason I keep slogging away on this blog! After receiving the message I thought that perhaps this Potato and Carrot Mash deserved its very own post. 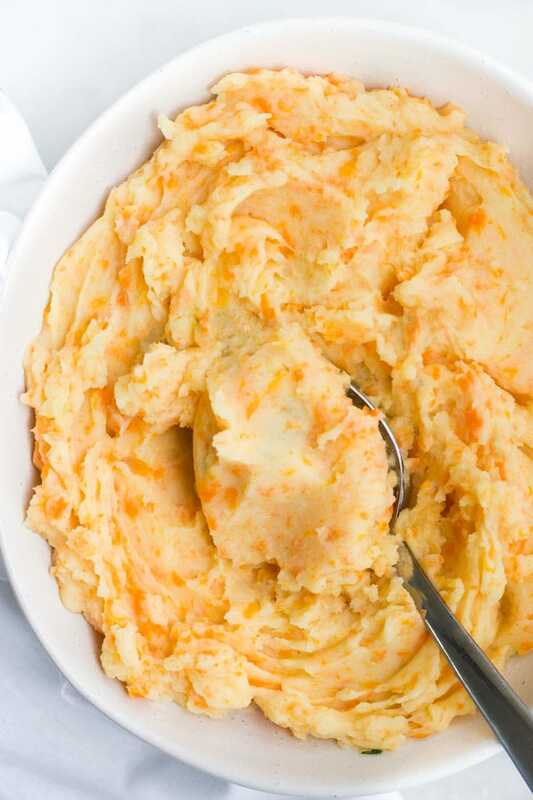 Potato and Carrot Mash – Cooking Tips. Great mash starts with the correct potato. There is a huge range of potatoes available and they have different properties that suit different cooking methods. To achieve smooth, light and fluffy mash you first need to choose the correct potato. Higher starch potatoes (such as Russet & King Edward) are the best choice for mash as they fall apart easily when cooked and they absorb flavouring more easily. Waxy potatoes, require more mashing to become creamy which can result in a “gummy” texture. You want to chop the carrots smaller than the potatoes so that they are nice and soft for mashing. The carrots don’t mash as well as the potatoes and you will have small lumps (see images.) 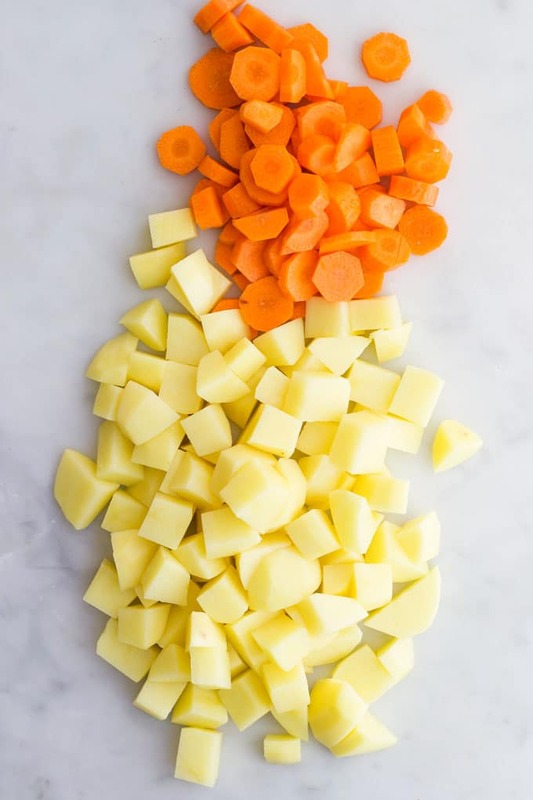 If you want a smoother consistency then you may wish to cook and blend the carrots separately and then combine with the potato when mashing. Cold butter and milk don’t absorb as well into the potatoes. 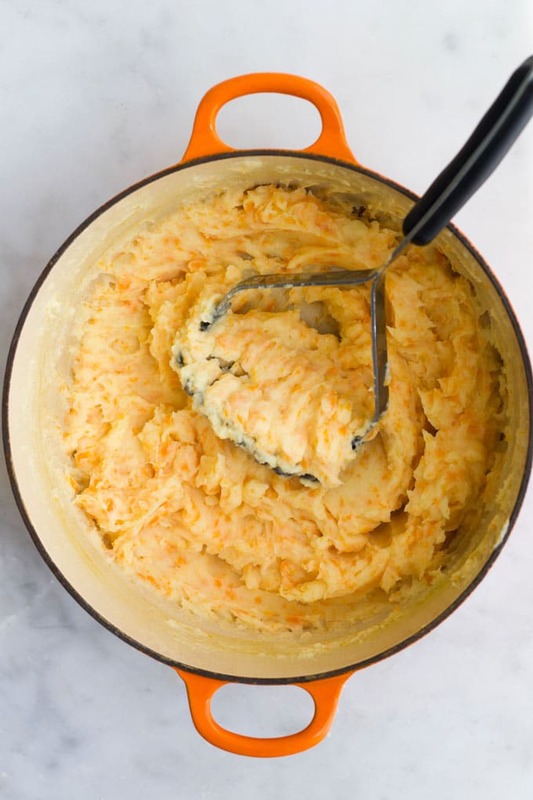 Gently heat the butter with the milk on the stovetop before adding them to your potato and carrot mash. Or at the very least bring your butter and mash to room temperature. Have you tried this recipe? I’d love to know what you think. Please rate and leave a comment below or tag me on Instagram or Facebook. 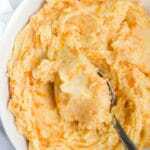 A delicious side dish, pie topper or baby puree. Choose a starchy potato that is good for mashing. See above post for more detail. Make sure to drain the carrots and potato well so that they aren't too watery when mashed. Warming the butter and milk will help keep the mash warm and absorbs better. The carrots do not mash as well as the potatoes and there will be lumps (as seen in the images). If you wish, you can puree the carrot. Pureeing the potato is not recommended, it will result in a gloopy mash. Puree the carrot separately and add to the potato when mashing. Nutritional information is a rough estimate only, calculated using an online calculator. I actually prefer this to regular mash. It was delicious.